Palolem Hills is in the southern part of Goa, about 58 km from Dabolim Airport, an hour's drive. Being close to the NH 17, it's well connected to all parts of Goa. 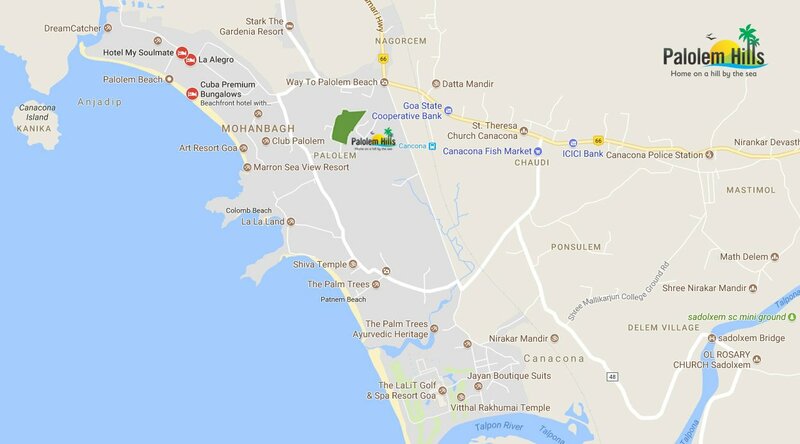 Canacona or Chaudi is the closest town to Palolem, less than 2 km away. The town offers facilities like School, College, Hospital and Shopping Centre. Pubs, Night Clubs, Restaurants and Shops keep up the hustle-bustle in the town. Enjoy delicious food served by several beach shacks while waves kiss your feet.